J/News Articles: Gorgeous Bahia de Banderas Bay Regatta! 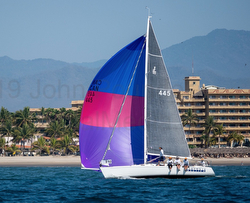 (Nuevo Vallarta, Mexico)- This year’s Bahia de Banderas Regatta will go down into the history books as yet another almost perfect weekend of sailing on the gorgeous waters off Puerto Vallarta. Thirty-seven boats in six classes enjoyed postcard perfect weather every day. The Vallarta YC, based out of Marina Vallarta, provided excellent race management, waiting for the seabreeze to build by noontime before sending the happy-go-lucky sailors out to sea for their races each day. In the end, it was a clean sweep of the top spots by J/Teams in the PHRF Performance classes. 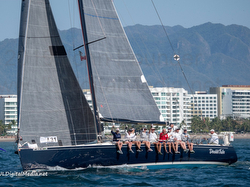 In PHRF Performance A class, Mike Seth’s beautiful dark navy blue DOUBLE TAKE cruised to both line and handicap honors with a 5-1-1 tally for 7 pts overall. Following in their wake each day was Lee Pryor’s maroon J/130 SIROCCO, posting a 4-2-2 for 8 pts to take the silver. Meanwhile, in PHRF Performance B class, Bart Smit’s beautifully maintained J/105 SINFONIA NAUTICA simply eclipsed their fleet with straight bullets for a total of just 3 pts in three races! Finally, the J/80 One-Design Class enjoyed good racing. Easily taking the class win was Wayne Zittell’s J-WORLD 1 with straight bullets for 3 pts total. Second was J-WORLD Team 2 and third was J-WORLD Team 3. Follow Bahia de Banderas Regatta on Facebook here For more Bahia de Banderas Regatta sailing information Add to Flipboard Magazine.